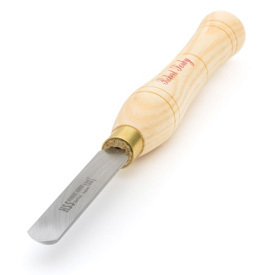 Size: Select 1/2" 1/2" Micro 3/4"
Get a skew chisel finish without using a skew with the Spindlemaster by Robert Sorby®. Generations of spindle turners have used this tool because they could make all the cuts used when turning spindles with a single tool. Not only is the Spindlemaster versatile, it eliminates the frustration of frequent catches common to skew chisels while giving you the same finish. Comments On Mar 31, 2017:I wasn't sure what to think when I placed the order, but I did so based on the reviews at that time. I'm impressed with this tool. Very versatile and easy to use. Works very well for spindle work, both large and small diameter. Stays sharp, only needs touched up when resharpening, and I'm finding that I'm using this more than my fingernail gouges. Comments On Jul 20, 2016:I really enjoy using this tool of soft detail work due to the fact that it is oval bottom so you can easily roll the cutting edge into a variety of positions. It is especially useful for the last "clean up" of your spindle turning. Comments On Jan 14, 2015:Easy to use, stays sharp , comes ready to use. Comments On Oct 03, 2013:I am a 'traditionalist' when it comes to turning and was a bit hesitant in purchasing this tool however, I quickly learned to love it! the cutting edge and bevel are designed for a variety of applications and the gently rounded reverse side of the tool allows even greater flexibilitiy for spindlework! Buy this tool - you'll be glad that you did!